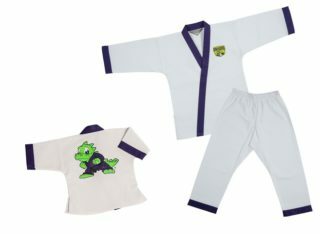 Student Karate Uniform (Lil' Dragons) by Century - Academy Of Karate - Martial Arts Supply Inc.
Used by Lil’ Dragon martial art programs everywhere! Designed to fit a little looser, these uniforms allow for all the games and activities your child will participate in while learning the martial arts basics. 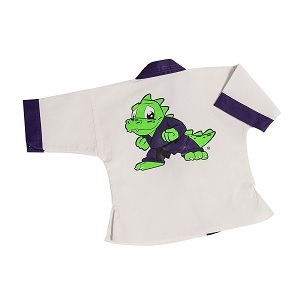 The uniform is a student gi with purple trimmed pant and pullover style jacket with hook/loop closure, easy to get on and off for this age group. Purple trimmed pants and pullover-style jacket with hook/loop closure. The jacket features a small Lil’ Dragon chest print and a large back screenprint. Made of a cotton/polyester, wash-and-wear fabric. 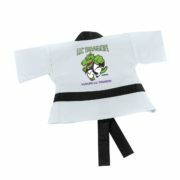 The 1-1/4″ elastic waistband has an inside drawstring. 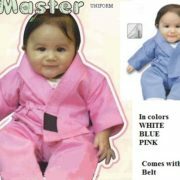 Available in sizes: 000-3. 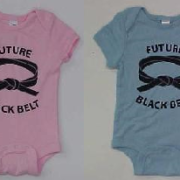 The infant uniforms feature a two-piece outfit with black belt attached to the jacket. They are not intended to be used as sleepwear.